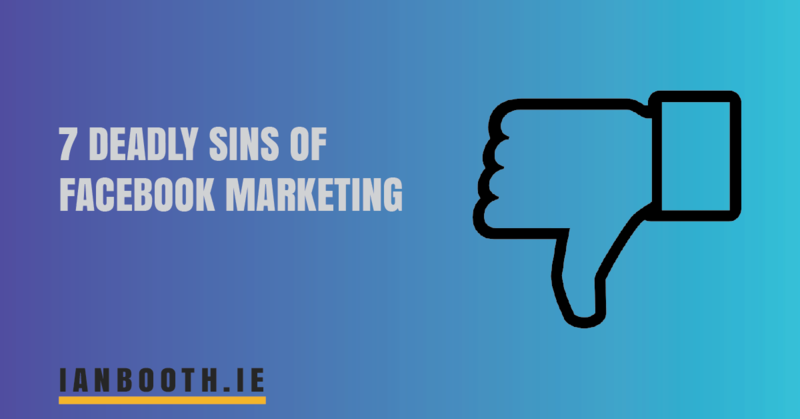 If you’re not doing Facebook marketing for your business yet, why the hell not? Everyone and their granny is on it these days you know! The fact is, most recent reports say about 60% of people aged 15+ in Ireland have a Facebook account and 70% of which use it every single day. In Ireland, it’s twice as popular as any other social media platform. Globally there are 1.32 billion daily users on Facebook. For one thing, this is against the Facebook terms of service (point4.4). Personal profiles are designed for people to use in a casual way, to connect with family, friends, and people they know. Facebook “pages” on the other hand are there for conducting social media marketing activities. So, all else aside, you could have your profile closed down without notice if you flaunt the rules. Besides the rules, many people don’t feel comfortable sharing their posts with strangers. A Facebook profile is a completely two-way platform (between friends or family), whereas Facebook “pages” allow other users to see the businesses posts, but it doesn’t work the other way around. Normal users can indeed comment and converse with a business page, but a business will not see a status update of a personal Facebook profile that “likes” their page. Apart from all the above, you would miss out on valuable insights provided to Facebook page owners, something you won’t have if you use a regular profile. Using a Facebook profile instead of a page is not a good idea. You might gain some short-term traction, but it’s going nowhere good (in most cases). If you have begun doing this, don’t fear – it is possible to convert a Facebook profile to a business page. If you think you’ve amassed a relevant audience, then you should convert it. For more on the difference between Facebook pages vs a Facebook profile read the guide by the social media gurus at Hootsuite. Businesses often lose sight of what Facebook and social media is all about. Break it down “Social” and “Media” – an incredible amount of businesses forget the first part. Instead, they treat it like a space to shout about themselves and what they’re trying to sell. That’s not very social, is it? If you were at a party and were talking about yourself all the time, people would avoid you. It’s the same on social media, except it’s much easier for them to avoid you in the virtual world. You need to bring value to your audience. Be Social. Use Facebook (and all social media) as storytelling platforms, places to connect and form relationships with your audience, but not as a billboard space. Because Facebook is a social media platform, people join it with the expectation that they can connect with their friends and family, as well as keep up-to-date with news and their interests. People generally don’t sign-up to scroll through adverts all the time. They don’t want to see you shouting about your offers and Facebook knows they don’t. This is why Facebook has limited the reach of Facebook business posts, they want to keep users coming back every day and therefore have quality control in place. So, businesses need to earn that reach by providing value to Facebook’s users. You should take this invaluable opportunity to grab the attention of the people you want to do business with and give them a huge amount of value, for free. Share your knowledge with them, entertain them and generally bring something of value to them. Facebook is a noisy place and its users’ attention is hugely valuable to you. Facebook marketing is a long-term game. On one side, you need to keep giving without any expectation of getting something back – but, there is the advertising which you can be used to target (with pinpoint accuracy) those who have shown interest in being your customer. This is a social media marketing concept coined by Gary Veynerchuk (also the title of his book) which outlines the strategy that everyone should be using to bring value to their audience and do business online. Be social. Use the people behind the brand as often as you can. Owners, management, staff, brand advocates, customers…etc. should feature on your page and in your content as often as you can manage it. In an environment like Facebook people want to interact with people, not logo’s. Consider putting faces in your profile picture and in your Facebook cover. Show that you are people, let your audience get to know you a bit better and start forming relationships. Make a connection with your audience whenever you can on Facebook and be social, for crying out-loud! Back in the day companies would spend a fortune (and still do) to pick the brain of their target market, nowadays we are given opportunities to do it on-the-fly, regularly. It’s not a scientific survey, but it can provide valuable insights to you. You should always look for opportunities to open a dialog with people on Facebook and don’t ignore negative comments in particular, instead address the issues – show that you care and are open to feedback. Work hard to turn negatives into positives. Business is all about relationships, so it doesn’t make sense to avoid building relationships on Facebook. You should strive to have a following of engaged people, who are likely to be your customers someday. Asking your family and friends (for example) to like and invite their friends to “like” your page might not be the right move for you – because this can lead to your page getting off on the wrong foot. The same applies for sharing irrelevant viral content – you need to always think about mapping the posts to your target audiences interests. As we know, the Facebook algorithm decides how many people will see your page posts. It does this by showing the post to a sample of your page likes – if these people react, it will reach more people. However, if they don’t react to the post, well, you’re left scratching your head – because nobody seems to care about your post! It’s very important that this sample of your audience will be high quality. Don’t dilute your Facebook reach with irrelevant people. Facebook page likes are all about quality over quantity. Your total page likes figure is nothing but a vanity metric, it means nothing to your business – unless all those likes are engaging with your page. Buying fake likes (just so you can earn bragging rights) will be detrimental to your organic Facebook engagement. That’s bad news! Running a ‘page likes’ advert campaign isn’t nearly as bad as buying a batch of fake likes from some dodgy source (FYI, they’re all dodgy). In fact, using Facebook ads to build your following is a good idea, if it’s done right. I (and many social media experts) find that page like campaigns often times don’t lead to very engaged audiences in the long term – unless they’re targeted to people who have already engaged with your business in some way. If a Facebook users first contact with your brand is them liking your page – based on an advert – then they really haven’t been fully qualified as interested to your page yet – they might be, but they might just click the thumb button while scrolling their feed, without much consideration. There are better ways to spend that ad budget. Retargeting your Facebook or Instagram page activity is an option in the Facebook ad manager. You can also retarget visitors to your blog (or any page on your website) with a multitude of combinations available. Clever retargeting from these sources is the best way to build your page likes and ensure a better future for your organic engagement. Pro tip: When somebody likes your pages post you can then invite them to like your page (for free!!). When you promoted an excellent page post and target the right audience (exclude your own page fans), you can get tons of really relevant page likes this way. If you’re sending users to a website – whether it’s your own site or another one – be sure the headline and description match what is actually on the web page. if it doesn’t, not only will you annoy people and lose the trust of your audience, you will also get caught out by the Facebook algorithm. Click bait and fake news are being targeted by Facebook’s quality control. People hate it. So, just don’t do it.